Happy Valley is a family run business with over 30 years’ experience in producing and sourcing some of New Zealand’s highest quality manuka honey from unspoilt and remote locations from all over the country. In recent years, the company has expanded into producing royal jelly, which Happy Valley uses together with its own UMF 15+ manuka honey to make its Royal Skin line of beauty and skincare products. Happy Valley manuka honey is licensed with the UMF trademark. 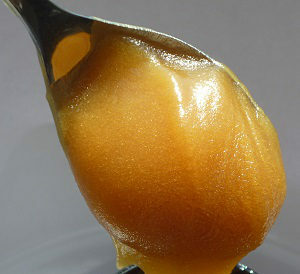 The Unique Manuka Factor (UMF) Honey Association has become the main trademark guaranteeing the purity of the honey. The UMF Honey Association has been at the forefront of a research project that has recently found naturally occurring markers in the honey that can be tested to verify that the honey is genuine manuka honey. This honey has a very delicate bouquet of a classic manuka honey – which means which means hints of both sweet and astringent flavours. 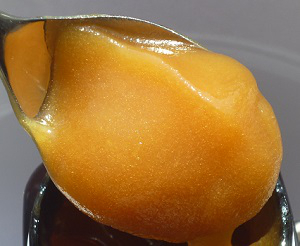 The delicate bouquet is not uncommon for a manuka honey. The colour is a glorious and almost spellbinding light brown colour that has an almost amber quality to it. 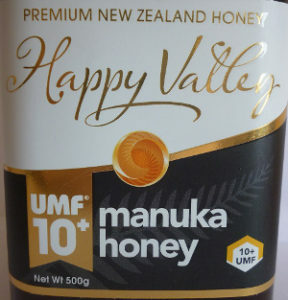 Happy Valley UMF 10+ manuka honey has an irresistible thick consistency like that of a soft, chewy toffee. It has a delicious balanced sweetness and unusually does not have the almost astringent taste that is common with manuka honey. It does, however, have a sweet aftertaste that is long-lasting on the palette with a hint of ripe fruit. This is a fabulous honey and can be recommended to anyone who has an interest in manuka honey. « Which Celebrities Love Manuka Honey?